From Rahway to Hollywood, by way of Underworld! Kaz joins the show to talk about his career(s) as a cartoonist, animator and artist. We talk about how he fell in love with the collaborative aspect of animation (and how the SpongeBob Squarepants sausage gets made), how the world caught up to the outrageous depravity of his Underworld comic strip, how Art Spiegelman taught him to be an artistic magpie, how he may have made Mark Beyer cry, how it felt to show his parents his work in an issue of Al Goldstein’s Screw, how he learned to make a story turn funny, and what it’s like to supply creativity on demand, and more! Give it a listen! 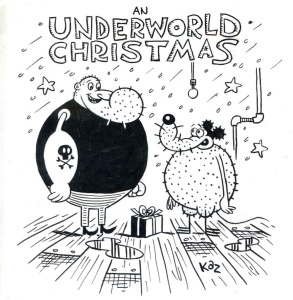 Kaz was born in Hoboken, New Jersey and started drawing comics for Art Spiegelman’s Raw Magazine while still in art school. 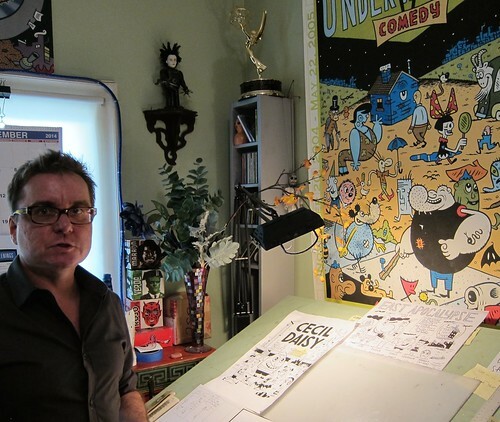 As an illustrator and cartoonist he’s contributed to many magazines over the years (from Entertainment Weekly to The New Yorker) and started his weekly comic strip, Underworld, in The New York Press. There have been 5 published Underworld collections and editions published around the world. In 2001 Kaz joined the crew of SpongeBob SquarePants as a writer and storyboard director. That lead to his work on Cartoon Network’s Camp Lazlo, where he won an Emmy for writing, and Disney’s Phineas and Ferb where he was nominated this year for an Emmy. Kaz is currently working in Disney TV development and in January will rejoin the crew of Nickelodeon’s SpongeBob Squarepants as a staff writer. The end of 2015 will see Fantagraphics publish a hardcover collection of Underworld comics titled The Book Of Underworld. Credits: This episode’s music is Her Eyes Are a Blue Million Miles by Captain Beefheart. The conversation was recorded in Kaz’s home on a pair of Blue enCORE 200 microphones feeding into a Zoom H5 digital recorder. The intro and outro were recorded on a Blue Yeti USB Microphone . Processing was done in Audacity and Garage Band. Photos of Kaz by me.